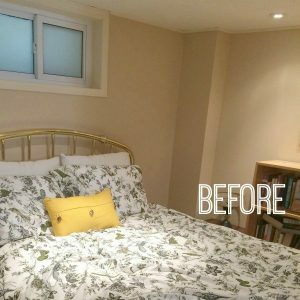 What a transformation our guest room has had! Above is a Before shot, clearly. An adequate space for guests to sleep – but completely uninspiring. I think it’s fair to say it had no character. The room has come a long long way. And one of our goals, along with making our guests feel welcome and comfortable, was to add layers of texture and interest to this supremely boring space. We’ve achieved a lot through our other basement makeover projects: Click here to check them out!